A quick post for a quick render – Sunrise City – my first proper test render with my new 64 Bit PC built entirely with it. My last PC was supposed to be 64 Bit but there was a complication in the manufacturing (otherwise known as Dell used some 32 Bit parts thus rendering the whole box trapped in a 32 Bit body with 64 Bit RAM and Processor). Anyway I’m now enjoying the 64 Bit life style. This quick image was made by taking a quickly built Wizard City from CityEngine and dropping it into Vue 9.5 Infinite. 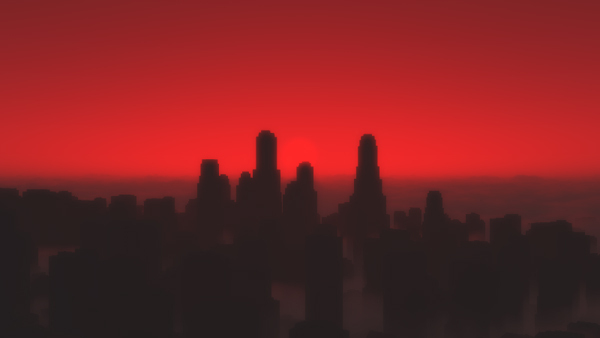 A few tweaks to one of the out of the box atmospheres to make it redder, to add a low cloud layer and to darken the buildings’ materials so they became stronger silhouettes and nine minutes later a larger version of the cityscape above was done. Resources never dropped below 85% even with both Vue and CityEngine running at the same time.